“Pretty Little Liars” fans get ready for a new FreeForm addiction in “Famous in Love,” written and produced by Marlene King (PLL) based on the book by the same title. “Famous in Love” stars Bella Thorne who plays Paige Townsen (without the “d”), a college student whose life is thrown into a world wind after landing the lead role of “August Roch” in a movie adaptation of a popular book series “Locked” (ie: “Twilight”, “Harry Potter”). The viewers can imagine this telling of the story of a real-life Kristen Stewart type actress as she navigates her sudden blast into famedom and learning the ropes as she goes. It also doesn’t help that she has real chemistry with her male lead co-star, Rainer Devon (portrayed by Carter Jenkins), son of the movie’s producer Nina Devon. But, also has equal chemistry with her roommate and best friend Jake (Charlie DePew). This, along with juggling her new life as a movie star makes things complicated, and throwing-in some college papers and classes to complete doesn’t even top it off! This is just the beginning. There’s also a rivalry happening between her co-stars Rainer and Jordan (Keith Powers) over a love triangle with pop star, soon-to-be triple threat Tangey Turner (Pepi Sonuga). Things get especially messy with the help of a thirsty entertainment reporter trying to make a national name for himself. The unpeeling of layers, upon layers of character back-stories, connections, and surprises are sure to keep viewers glued to this new and exciting FreeForm series. 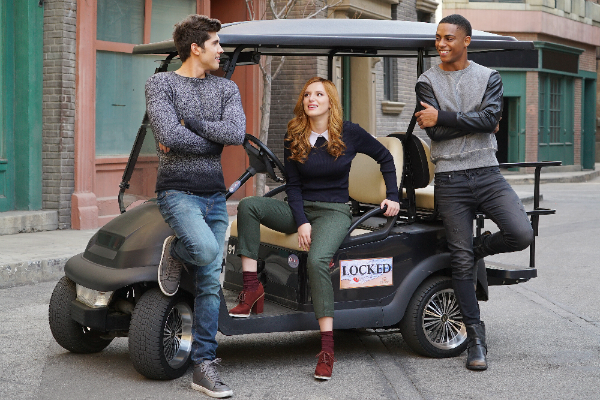 In a FreeForm interview, Thorne stated that the the “Locked” story has changed quite a bit especially than what it is in the books. She said they switch through different time periods in “Locked” such as the 1940’s, and 1970’s. Thorne said she learned a lot about those periods including the acting styles. Actress Perrey Reeves (Nina Devon) said PLL audience is going to love the show because “Marlene’s signature is all over it.” She said “viewers will be held in suspense on who’s doing what to who, and how is that happening.” As for her character, viewers will have to wait to see what Nina is really up to. Reeves said when viewers find out, they will not be disappointed! King said this is a show she’d be hooked on. “We live in such uncertain times now. I want to watch a show where I can sit back and have fun and get lost. This is one of those shows.” She promises “lots of twists and turns,” with at least one surprise in every episode (sometimes multiple surprises). King said the characters’ decisions are sometimes for the greater good. Sometimes they make mistakes. Serle promises, although there have been changes made to the television series different from the books, “we have both of those things in the television show as in the books. The heart of what fans really love about the books. We are going to take you on the same ride of wish-fulfillment and adventure and what the underbelly of what Hollywood is really like.” She said she thinks fans will have a lot of fun with it. “Famous in Love” premieres on the FreeForm network on Tuesday, April 18, 2017 at 9 pm, after “Pretty Little Liars”. Viewers will be able to watch all ten episodes on the Freeform app, Freeform.com, On Demand and Hulu.